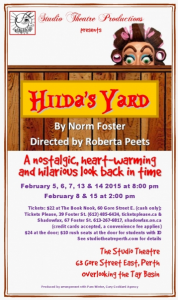 A hit comedy from Norm Foster, Canada’s most beloved playwright! When veteran stage director Jeremy Dutton saw a production of Norm Foster’s play ‘On A First Name Basis’ in St. Catharines recently he knew two things right away: first, the show is a deliciously irresistible winner, and second, he just had to bring it here to Perth. On A First Name Basis is one of Norm Foster’s more recent plays, and it proves that the tools he has wielded so skillfully for years as a playwright — humour, heart, and humanity — have become even sharper with age. This is a simple, intimate, remarkably engaging show starring two of the Studio Theatre’s finest veteran actors, Hugh McCulloch and Krista Duff. In the hands of these two mature and capable players –and under the direction of Jeremy Dutton, known for his skill with humour as well as drama — On A First Name Basis is a play that’s well worth getting to know. 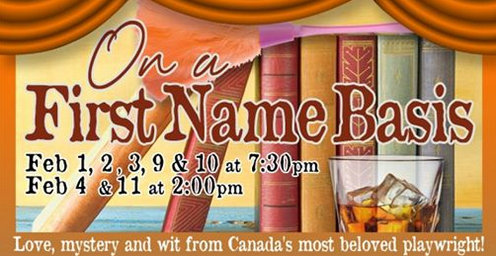 On A First Name Basis premieres at the Studio Theatre on Thursday, February 1 for seven shows, Feb. 1, 2, 3, 9 & 10 at 7:30 pm and Feb. 4 & 11 at 2 pm. Advance tickets are $24 and are now available exclusively at Tickets Please in the Matheson House Museum Visitor Centre, 11 Gore St. E. (613 485-6434; ticketsplease.ca) which accepts in-store, phone, online and credit card purchases. Tickets are $24 at the Studio Theatre box office on show nights. Rush tickets for Students with ID are just $10 at the door, subject to availability. Attend opening night and save $5! On A First Name Basis is Norm Foster at his absolute best. We invite you to enjoy it as a warm entertainment on a cold winter evening, or as an early Valentine’s gift to someone you love. Feb. 1, 2, 3, 9 & 10 at 7:30 pm and Feb. 4 & 11 at 2 pm. 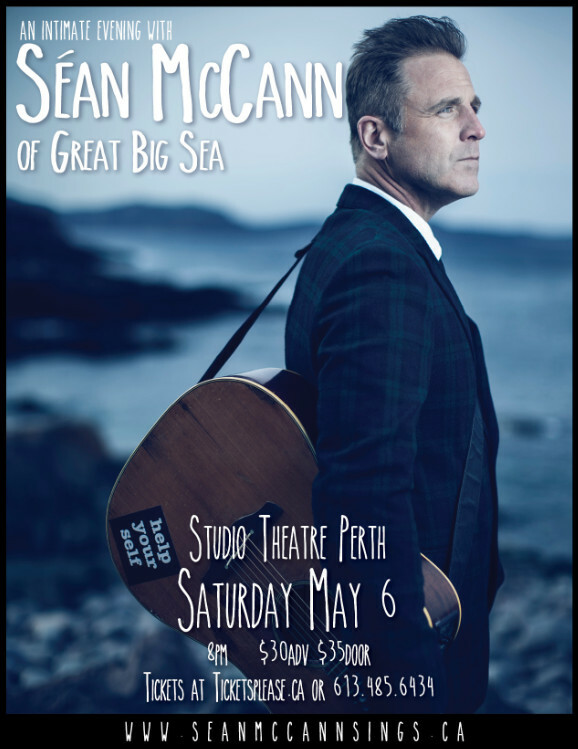 Great Big Sea’s Séan McCann won over audiences from coast to coast and around the world as a founding member of the award-winning Newfoundland band. Today, McCann is charting his own course with a new sound. His live performance combines original songs and stories designed to inspire and change lives for the better. Same great voice, songs that sing to your heart, and an engaging performance perfectly suited to the quiet intimacy of the Studio Theatre. Bring along a lawn chair or simply enjoy a leisurely stroll through the park. All concerts are FREE to the public and are held in historic Stewart Park just behind the Perth Town Hall in downtown Perth. For more information visit the band’s website at http://www.perthband.ca or call conductor Brian Tackaberry at 613-256-4221. Wednesdays August 3, 10, 17, 24, 31, 2016 @ 7 p.m.
Lucky charms, big dreams and a troll named Thor. It’s Friday night at the bingo hall and the gloves are off! Carol needs to pay off her debts. Sandi’s hot for Lou, the rock n’ roll bingo caller. And there’s Irene, the cranky old know-it-all, oxygen tank in tow, who always wins. When Carol steals Irene’s lucky spot, it sets off a course of events that none of them could have predicted. A brand new musical about friendship, gambling and just how far you’ll go for the big win. 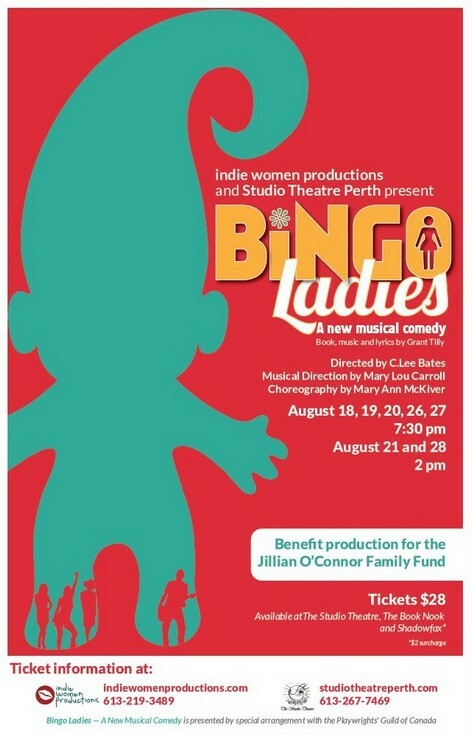 Bingo Ladies is co-production of Studio Theatre and Indie Women Production. This is a charity event in support of the Jillian O’Conner Children’s Education Fund. There will be a silent auction and other fun event in the theatre lobby at each performance. http://www.studiotheatreperth.com or indiewomenproductions.com for further details. 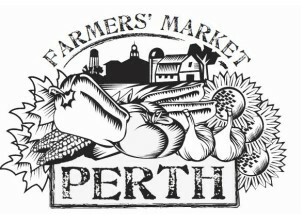 THE PERTH FARMERS’ MARKET takes place every Saturday morning between May 7th and October 8th, 2016, in the Tay Basin Parking Lot and around the Crystal Palace. Vendors are set-up between 8am and 1pm and offer fresh, local, organic in-season produce, plants, preserves, meat, home baking, and tons of other goodies. The Market also offers artisans and crafts, jewellry, entertainment occasionally and chance to have breakfast at the Piggin’ Out Market Cafe. This is a great way to spend a Saturday morning, getting to know your local producers in the heart of downtown Perth! 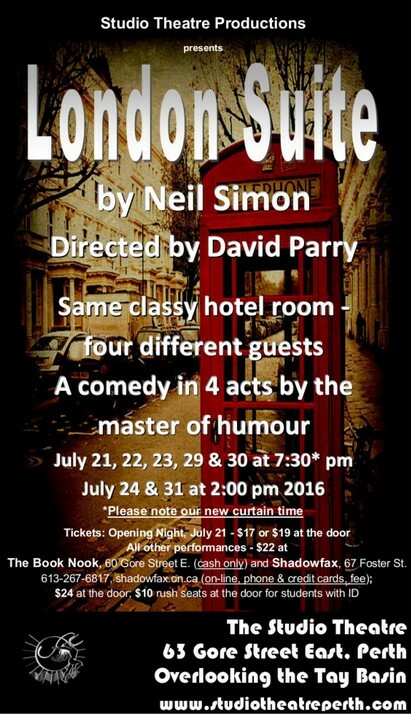 Wednesdays July 13, 20, 27, 2016 @ 7 p.m.
Neil Simon’s rich comedy of four separate stories that take place in the same hotel suite at different times of the year. A writer holds a gun on his agent, who, he believes, has embezzled all the money from his book sales. A middle-aged New York widow on a shoe-buying expedition in London with her daughter, meets a rich Scotsman and wonders if she’s ready for a change in lifestyle. An Oscar-winning actress and her former husband, now divorced and are seeing each other for the first time in years. He needs money for his lover who is dying of cancer. This bitter-sweet story has a twist in the tale. Finally, a couple’s vacation plans are disrupted when they lose their Wimbledon tickets and possibly their hotel room to a Hollywood star. http://www.studiotheatreperth.com or http://studiotheatreperth.com/london-suite/ for further details. For more information on how you can attend, please contact the president, Jane Law, at perthhortpres@gmail.com. 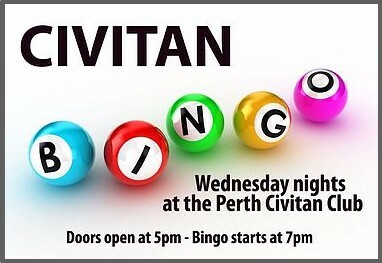 The MERA Book Club meets on the 1st Wednesday evening of the month at 7:00 p.m to 9 :00 p.m.
Every Wednesday night at the PERTH CIVITAN HALL, BINGO starts at 7 pm. Doors open at 5pm. 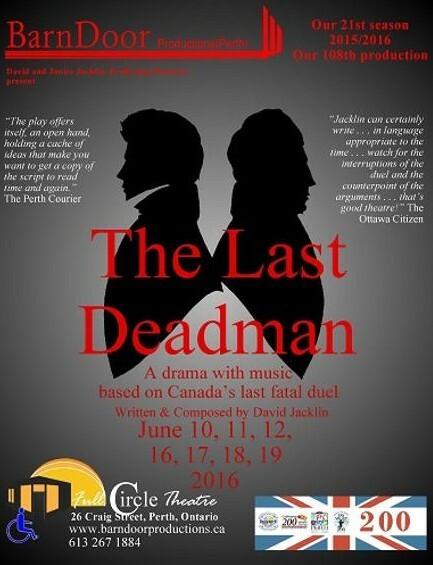 Wednesdays June 1, 8, 15, 22, 29, 2016 @ 7 p.m.
BarnDoor Theatre Presents “The Last Deadman”: David Jacklin’s legendary drama with music about Canada’s last fatal duel. First performed in 1983 (the 150th anniversary of the duel), this intense drama looks at the effect of the duel on its victor — a man who very nearly became Canada’s first prime minister! More than simply a story of a lady’s slighted honour, the duel had far-reaching consequences for the shaping of our nation. Told with drama, music, humour and excitement, it is a challenging and surprising multi-media theatrical event. 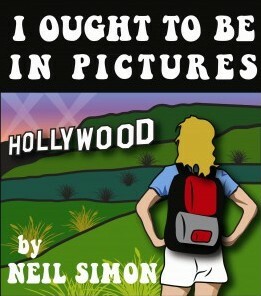 Neil Simon’s I Ought to be in Pictures (June 24 to July 17) is a heartfelt comedy about a father and daughter rebuilding their relationship after years of disconnection. “A mature, touching, memorable play that brings great joy to the season” (Clive Barnes, New York Post). “Neil Simon’s best play since The Odd Couple” (Women’s Wear Daily). Tickets: 2 for 1 Opening Night only. On May 21, buy a regular price ticket at the door ($27, cash only) and get a 2ndticket free. Offer subject to availability-first come, first served. The Amazing one-man tribute to Kenny Rogers featuring Peter Davidson. Sat Oct 22nd 8:00 pm at Studio Theatre Perth. Tickets $28.00 each, available by calling 613-267-6817 or 1-800-518-2729.